The New Republic har följt mannen som många började tro kunde bli en utmanare till Barack Obama 2012, men som istället valde att bli densammes Kina-ambassadör. I ett utmärkt reportage funderar de vem han är och varför han valde Kina före Vita huset, i alla fall denna gång. Eller som de sammanfattar det i underrubriken: "Spending time with the man who wants to be the future of the GOP, just not its present." 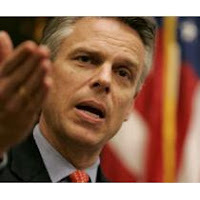 "Huntsman was assembling all the pieces for his presidential campaign. And as he positioned himself as the next John McCain, he was gaining traction nationally: According to a nationwide March poll, likely 2012 voters chose Huntsman's vision for the GOP over Rush Limbaugh's vision by 20 points. So what happened?" "In light of Arlen Specter's defection and Tom Ridge's decision not to run for his Senate seat, the clear message is that there is no place in the party for moderate voices. " "Quoting political historian Theodore White, he told me when we spoke last month that he was happy to defer "to the inevitable cycles of history. Some of them are so inexorable you can't fight against them." In deciding to go to China, he seemed to be conceding that he wasn't going to win the battle for the GOP's soul this time around. Better to wait for the cycles of history to align in your favor."